In Absence of Malice, Sally Field is Megan Carter, a reporter who makes mistakes—many mistakes. When a federal prosecutor, desperate for leads in an ongoing investigation into the disappearance of a local union leader, conveniently leaves the case file on his desk, she reads it, and subsequently writes a story about the alleged suspect, Michael Gallagher (Paul Newman), a local liquor wholesaler and son of a deceased Mafioso. But Gallagher is innocent, set up by the FBI in a desperate move to squeeze information out of him regarding what they believe to be a mob kidnapping. In a strategic ploy on the prosecutor’s part to have Carter leak news of the bogus investigation to the public, the unattributed story she proceeds to write is only the first of many misjudgments on her part, as she then prints another story exposing a devastating secret about Gallagher’s alibi, and also becomes involved with the very subject of the investigation: Gallagher. To say that this film isn’t the most accurate depiction of investigative journalism to hit the big screen is a grave understatement. The many blunders Carter commits combined with the far too permissive, and sometimes complicit attitude of her editor makes for a far from credible depiction of the inner workings of a newsroom. While the absence of malice law protects Carter and the paper from legal retaliation, it is clear that she is a careless, misguided reporter, who lets her ambition cloud her moral judgment on more than one occasion. 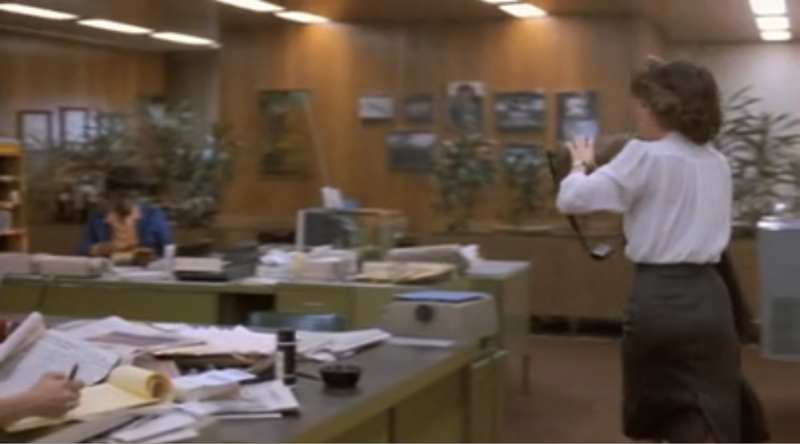 But in spite of her professional indiscretions, and despite the story’s lack of credibility, Absence of Malice still makes for a very entertaining drama about the ethics of the profession and the harm irresponsible reporting can inflict on innocent bystanders. Carter makes lousy decisions, but at least, she’s judicious in her sartorial choices! In a world where hemlines are getting shorter, and where the only options for knee-length or just above-the-knee skirts lie in the astronomically priced Victoria Beckham arena of designer duds, Absence of Malice enables us to indulge in perfectly tailored blazers, billowy skirts, and beautiful silk blouses, an enviable timeless wardrobe that will have you hitting up the nearest consignment shop in the hopes of scoring similar smart clothing. And while no respectable reporter would ever sleep with the subject of an ongoing investigation, when said subject is Paul Newman, well, clearly all is forgiven. But Carter deserves the hell that reigns down on her in one dramatic scene when Gallagher, visibly upset that her lack of judgment has resulted in the loss of a dear friend, assaults her. And we do gain utmost pleasure when Gallagher exacts his sweet revenge, in the end outsmarting just about everyone else.